I wish the headline was a metaphor, but it’s literally what happened. 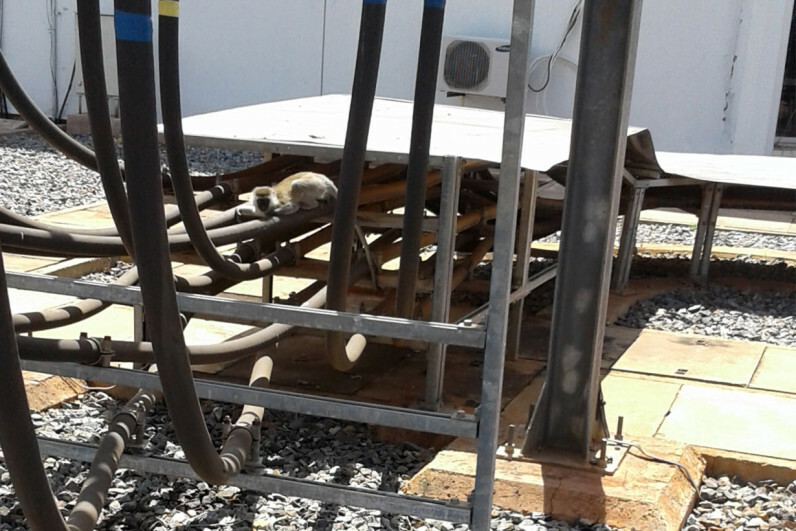 On Tuesday evening, a monkey scaled the roof of Kenya Electricity Generating Company, KenGen for short, and fell on to a transformer. From here we have a twisted version of dominoes: With the monkey on the transformer, the machine stopped its electrical flow. Once that first transformer stopped, every other one tripped as well, triggering a national blackout for approximately three to four hours. The KenGen power plant the monkey fell into is the country’s largest, which generates about 10 percent of electricity nationwide. All in all, the company said the incident caused Kenya to lose about 180 megawatts of power. The monkey survived the fall onto the transformer, and has since been given to Kenya’s widlife services. KenGen says it has fences to prevent animals from entering the plant, calling this an isolated incident it doesn’t foresee happening again. It does promise to look into better solutions to further enhance its security. Maybe it should instead find alternative infrastructure solutions where a 15-pound weight won’t bring the whole nation to a halt.